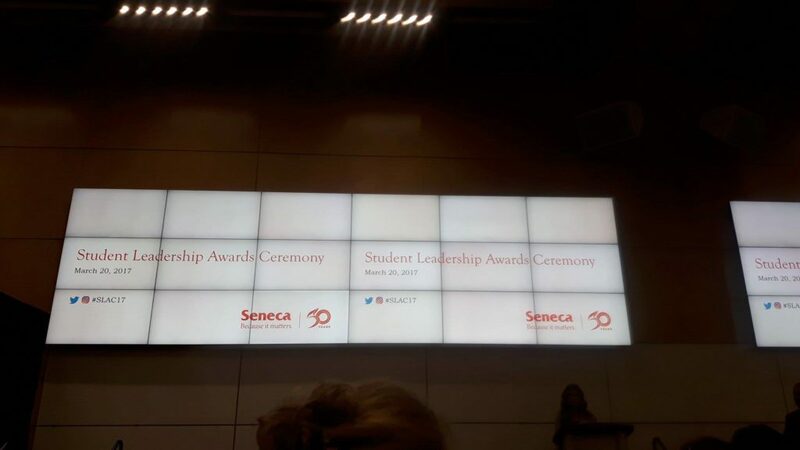 Last year, I was delighted to create my own leadership award at Seneca College. The primary reason was it was in my bucket list and I always wanted to give back. I named the award – Urgen Kuyee Leadership Award. 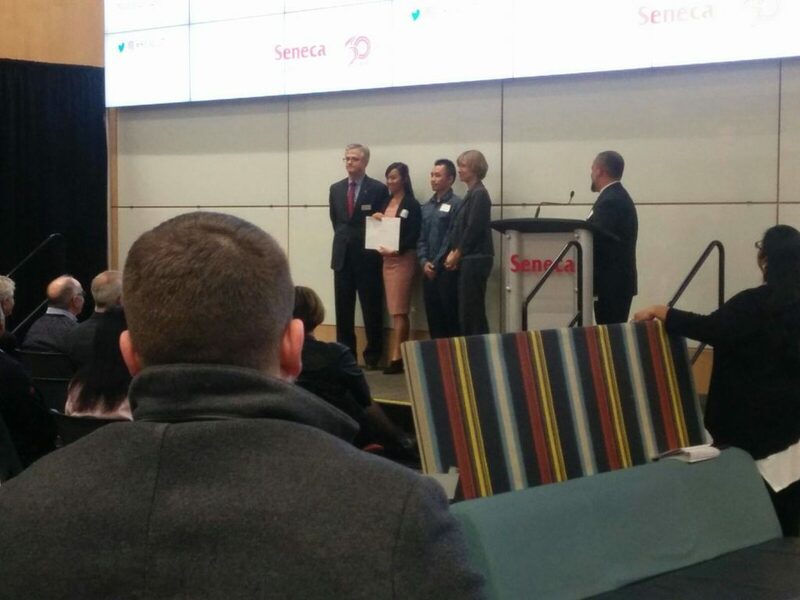 The award is worth $1000.00 and will be given to a full time Seneca College student annually. I got mixed reactions from family members, cousins and friends, which I expected. My friends said, “Urgen, you are still in your twenties. You give back when you are a little older. Maybe in your fifties and sixties”. I flatly disagree. I don’t think we have to wait to give back. I was fortunate enough to receive several scholarships, leadership awards, bursaries et cetera when I was a student at Seneca. I received thousands of dollars by being proactive, applying for every awards, scholarships and bursaries Seneca was offering. Of course, without my professors nominating me for a leadership award or providing references when needed, I would receive an egg. Thank you Judith Minsky and Susan Kagan. So, in a way, I am just giving back what Seneca gave me when I was a student INTEREST free. The money I received from Seneca helped me immensely when I was facing some financial challenges as a nursing student. My hope is that – Urgen Kuyee Leadership Award will have the same impact on the students who receive my award. I was never broke or struggling bad but just little things here and there. For example, being able to buy a TTC metro pass instead of buying TTC tokens, buying that extra pair of nursing scrubs or going out with friends and enjoying chicken wings. Today, I work as a nurse and I am glad I am able to give back. Look, you don’t have to be Bill Gates rich or Angelina Jolie to give back. Heck, NO. This is so obvious that it physically hurts me to type it. Plus, it does not have to be a leadership award or in monetary value. You can give back and help hundreds of people with so little effort. I used to volunteer in a Toronto Public Library, I volunteered during the recent PAN AM games held here in Toronto. During nursing school, I used to organize CPR classes for all my classmates. I remember in high school I was a member of the recycling club and we used to clean up the garbage out of all the recycling bins after school. Again, if you want to give back, you can do it in several ways. Go coach a soccer team or teach English to new Canadians. Dan Miller, New York Times best selling author of 48 Days to the Work You Love rightly said, “We don’t become millionaires by hoarding resources so we can eventually “give back”. Instead, it appears millionaires have been giving back from the very first day.” I agree with you Dan, one thousand percent. Side note: I don’t even have six figures in my bank account as I write this post. But, do I want to become a millionaire? Heck, yeah. Too many of you are scared to tell your goals but you should not. We need to get honest with ourselves and only then; we can work to achieve our goal. 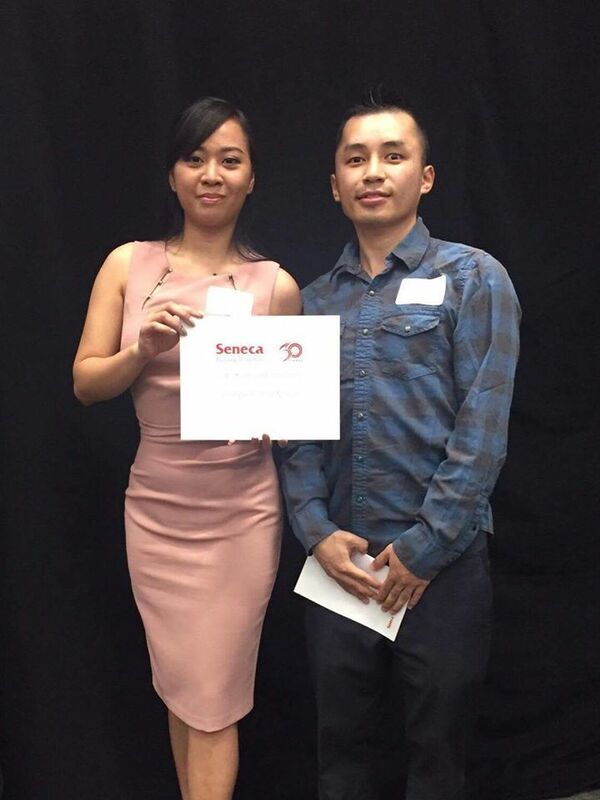 Urgen Kuyee Leadership Award ($1000) is awarded to a student in good academic standing with a GPA of 3.3 or less who demonstrates leadership qualities towards the enhancement of the quality of student life at Seneca. The recipient must demonstrate a contribution to others and to the community by being involved (e.g. peer tutoring, organized study groups, educational and fundraising initiatives, sports, student government etc.) Preference will be given to a student who is volunteering or has volunteered at the Toronto Public Libraries. Students must provide a staff reference from a Seneca employee. Please be aware to be eligible for my award, the student’s GPA has to be LESS than 3.3 (I graduated with a 3.3 in case you are wondering why 3.3). Too many students are obsessed with their GPA and fail to develop other critical skills. Leadership skills, positive attitude, likeability factor and people skills are one thousand times more important than your GPA. Don’t let anyone tell otherwise. I graduated with a 3.3 and got a job two weeks before convocation day. Some of my classmates graduated with honours and high honours but the truth is they struggled to find a job for months. Sadly, I know a couple of them who are still jobless. Yes, go get your education and graduate but don’t be too obsessed with your GPA. I would love to see you apply for my leadership award. Please do spread the word. You can apply here. Lastly, I was humbled to present the very first recipient of Urgen Kuyee Leadership Award this past Monday. The recipient was Johanna Ruth Gonzales, a marketing student and a well-deserved recipient. I got the chance to speak to one of her professor and the professor spoke very highly about her. Keep up the good work, Johanna. With the very first recipient of my award, Johanna Ruth Gonzales. 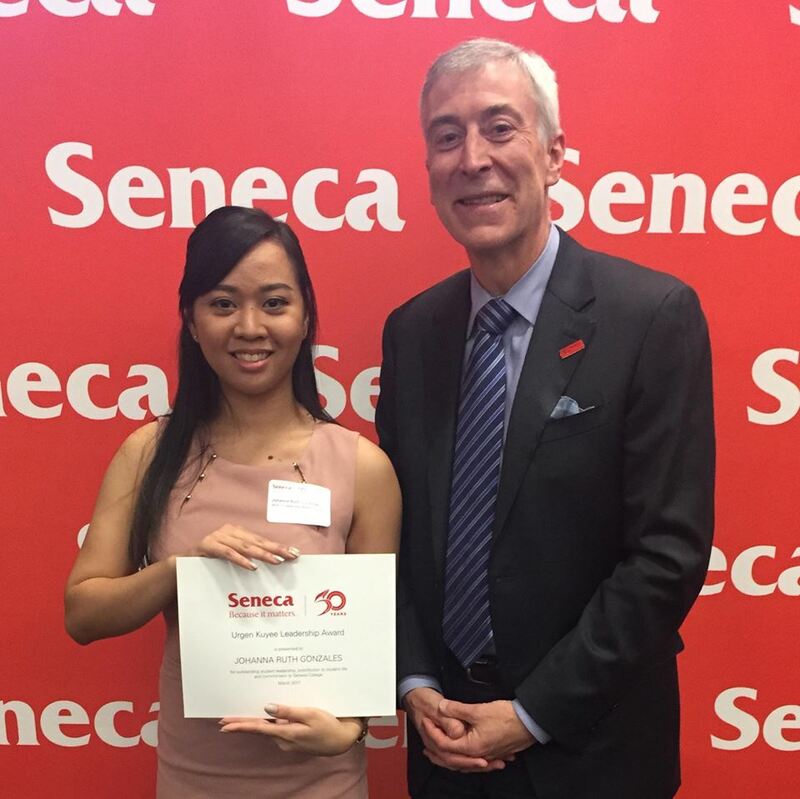 Johanna with David Agnew, president of Seneca College. “Urgen, you are such a blessing and inspiration. This award will touch a lot of lives and will motivate students to keep doing of what they do as a student leader. I’m so grateful to receive the very first Urgen Kuyee Leadership Award. Thank you Urgen!” – Johanna Ruth Gonzales. Previous Post Interview with Jim Keohane, CEO of HOOPP. Next Post Podcast with Nibin Thomas.